November 15, 2016 by Technical Management, Inc.
“Things are a changing” in the defense industry. A new administration and National Security Strategy coupled with pent up demand for next generation systems (not yet planned and programmed) worth hundreds of billions of dollars represent opportunity. Despite uncertainty, keeping core programs sold with performance upgrades, strategizing for the next generation developments, and investing now in technical advances to win the few planned competitions are top priorities. Competitions will involve source selection among products with different levels of performance—in short, a selection from asymmetric product offers. Most of TMI’s clients have strong engineering capability and a legacy of advancing technical capability. Thus, they are “genetically incapable” of offering only a minimum compliance product. Their product offers are threshold plus and often, objective level. Despite RFPs stating “best value to government” as the basis for award, the offeror with lowest Total Evaluated Price (TEP) and threshold level performance often wins. Insights on how to win best value trade-off source selections are presented in this month’s Winning Insights post. Imperative for Advances. While the need to counter threat continues, competition policy results in threshold capability equal to the lowest competing product to the detriment of mission capability. In recent years policy defines two categories of source selection strategy: (1) Low Price Technically Acceptable (LPTA) and (2) best value trade offs. Best value trade offs provide two alternatives: (1) subjective judgment and (2) Value Adjusted Total Evaluated Price (VATEP). The collapse of the Soviet Union and acquisition reform shifted acquisitions from threat-driven, spec-based prescriptive RFPs to performance based RFPs. Wherein a few critical performance parameters (KPPs) are required. And, based on the claims of competitors, an objective beyond threshold is derived to define the performance vs. cost trade space (where capability trade offs could be valued analytically or subjectively). Asymmetric Product Performance. Few (if any) “clean piece of paper” spec driven new starts and a risk adverse environment have resulted in leveraging NDI, OTS, and the contractor’s own product portfolio. Thus, customer source selection (SS) is a choice among acceptable, but differing levels of capability. – Does added performance make a demonstrable difference? – And is the difference worth the possible additional cost to the government? Collaborating with select customer members to help further define/refine the questions and “monetize” the added value in the context of the mission is the capture challenge. In short, the challenge is to illustrate via mission analysis the difference that performance makes; get source selection “standing’ for added capability; sell the case that the difference is meaningful; and substantiate the value in the proposal. – It provides cost savings (cost effective operationally or logistically). – The PCO, with concerns of a protest by LPTA competitor, does not stand in the way. Note: during the 1990s and 2000s, more than70 % of best value (albeit most were subjective trade offs) went to the contractor with the lowest Most Probable Cost (MPC) to government. Wonder why? As Best Value SSs “play out” the LPTA “anchor” often becomes the easy answer. Meaningful. To advance added performance from just “interesting” to meaningful, in the mind of the customer, requires the context of a CONOPS. In the early stages of an acquisition the CONOPS is the framework for requirements definition. As stated in CJCSI 3170 JCIDS: “CONOPS provide the operational context to examine and validate capabilities required to solve a current or emerging problem.” CONOPs should cover: (1) problem addressed, (2) mission, (3) Commander’s intent, (4) operational overview, (5) functions/effects to be achieved, and (6) roles and responsibilities of affected organizations. Individual Services have specific command centers for guidance and formats, e.g., Naval Warfare Development, Army TRADOC, Marine Combat Development, and USAF Doctrine and Regional Commands. Demonstrable Difference? CONOPS alone will not answer the central SS question. However, mission analysis (with applicable measures of effectiveness), in context of CONOPS, can answer it. Acceptance of the answer depends on CONOPS, modeling, and measures reflecting the input of the user, Requirements Officer, program sponsor, and customer mission analysis organizations. Sharing the results along the way and responding to the issues raised is the ultimate pre-sell process leading to validation and acceptance by the customer. Measures of Effectiveness. 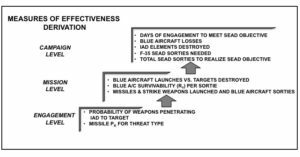 Measures are derived for the specific mission, product performance effects, and level (engagement, mission, campaign) of analysis as shown in the strike weapon example below. Engagement level analysis illustrates product performance differences. When rolled up as input to mission level analysis, these result in the quantified demonstrable difference. Raising the Stakes. If the engagement level results do not clearly monetize the added performance value enough to justify the choice, then escalate to the mission level where the stakes are higher. In the strike weapon example, results of added weapon launch range performance may not justify the added cost in engagement level analysis. However, moving up to the mission level brings cost leverage of launch platform survivability into play, wherein avoiding the air defense exposure and loss of a few launch platforms is a huge cost benefit. The sufficient condition is that customer has the additional funds (if needed) and the PCO state of mind isn’t burdened with the LPTA anchor. Countering Perceptions. The burden of proof is with the contractor to discount and/or eliminate the perception that added performance equates to added cost and risk. The problem is: how? Added cost doesn’t mean unaffordable. The key is to show VALUE gained for the added cost. Discounting risk is enabled by using IRAD or company investment to demo technology maturity. Additionally, “Miracle of the Month” demos during the pre-RFP phase and featuring a demonstrated history of controlling risk will further discount perception of risk. The proposal alone, even with substantiation, cannot make the case. Shaping the SS strategy & RFP, cultivating user pull (for mission capability) and acquisition push (capability is affordable in low risk executable program) are musts. TMI’s subject matter experts in CONOPS, mission analysis, and business case analysis are available to help define your plan to determine the demonstratable difference and answer the question of whether or not the added capability is worth it. October 2, 2016 by Technical Management, Inc.
TMI has contributed to numerous Opportunity Creation efforts that span the life cycle from pre-acquisition through the operations and support phase in collaboration with both system primes and technology-based product companies. The insights presented in this “Opportunity Creation” post—the second of a two-part series—discusses the evolution of the Advanced Programs culture, the current acquisition environment’s need for speed, and specific strategies for effective Opportunity Creation. – Helping to create and then win a major new start. – Protecting and keeping a core program sold. – Achieving an innovative take away of a competitor’s core program. – Developing a capability to fill a decades old capability gap. Current Environment. Today’s environment is characterized by fewer new starts, developments paced by fixed level of annual funding and protracted by the acquisition process, a DOD budget investing 25% less in R&D than in recent years, and an A&D industry investing much less in R&D while electing to use discretionary funds to buy back stock. All of this occurs in a world where historic United States’ technological leadership is being challenged by emerging threats. Dedicated to the defense business, the leading companies will allocate more resources to invest in their future including “decisive” future technologies. They will parlay their focused IRAD results into capturing CRAD to advance the Technology Readiness of their innovations with a focus on maturity level adequate to assure a low-risk EMD. OSD’s Response to the Need for Speed. Since the beginning of the Global War on Terror, OSD has recognized the need for initiatives to bridge capability gaps and thus get critical end items to Commanders in historically short timeframes. Thus, Quick Reaction Capability (QRC) has been accommodated by tailored and streamlined acquisition strategies that essentially circumvent elements of the classic DOD 5000.2 Process. OSD has established a Rapid Technology Transition Office (RTTO) with the objective of developing and fielding advanced technologies in 12-18 months. USAF has a Rapid Capabilities Office headquartered in the Pentagon under SAF AQ. Similarly, the Army has a Rapid Equipping Force (REF.ARMY.Mil). SOCOM has its own accelerated version of its streamlined normal process. The Navy does not have a separate dedicated office, but grants each Program Executive Officer (PEO) the authority to utilize approaches listed in SECNAV Instruction 5000. Many other acquisition initiatives exist that are unique to products acquired by specific acquisition agencies. Each Service has processes that implement QRCs in similar but slightly different ways. Major Opportunity Creation Examples. For reference, Opportunity Creation Part I described a select sample of major OCs from the dozens created since WWII. Where You Make It. Part I presented a holistic and comprehensive look at the scope of OC, particularly in terms of the necessary conditions for success. The specific conditions, beyond the necessary, are opportunity unique and more difficult because they require an active role by the customer set (user, tester, and acquirer). Listed below are select key elements that have had significant impact on success and thus, by definition require management attention in crafting the culture and organizational construct for success. Advanced Programs State of Mind. In the Post WWII cold war where technical advances were threat driven, technology was king and government acquisition agencies had the flexibility and authority to invest in prototypes to validate a capability. Advanced Programs Departments across the industry created the products needed to stay ahead of the enemy, many of which came from Advanced Programs groups where a culture existed to match perceived and emerging need with new enabling technology. There was a willingness to invest and the patience to tolerate failures (all of which resulted in technology advances despite not realizing the ultimate objective). Since the Post Viet Nam downturn (late 1960s) and the post “threat meltdown” (collapse of the Soviet Union in 1989) the industry has evolved from being focused and dedicated to the national effort. In the past three decades industry has become more beholden to shareholders and Wall Street. And with this came decentralized P&L accountability and more attention to making the numbers. This focus is not bad per se, but it has eroded the Advanced Programs culture. Thus, Business Unit General Management must free the Advanced Programs technical entrepreneurs from much of the burdensome process of capturing new business, which companies tend to impose on all new pursuits. Additionally, they must provide an independent Advanced Programs budget and ensure that the department leader has the capability and bandwidth to manage the function. Also, across the business unit a critical mass of the capabilities (operational visions of warfighter needs for your products, CONOPS and mission analysis, etc.) are necessary to create and sell the mission capability being created. Likewise, general management must step up to the most difficult of organizational and staffing problems: balancing the functions and responsibilities between product line management, engineering management and Advanced Programs management as they contribute to Opportunity Creation. This balance doesn’t require a Jack Welsh cultural shift like GE experienced in the early 1990s with his initiative to win with ideas by empowered employees. Nor does it require the contrarian Google-X culture of incentivizing engineers to kill new ideas to enable more focus on the good ones and/or at least point out the hurdles the idea has to overcome to make it to graduation as a product. Collaboration. Continuous collaboration with user, tester, and developer must be part of an orchestrated plan where timing is critical. QRCs Start as Orphans. No QRC starts with organic personnel or program of record funding. Thus, in true entrepreneurial fashion, the company OC leader must scrounge for company support and work to get supplemental funds to support the effort. Supplemental appropriations bridge the two-year gap between the POM and allocated resources to a program of record. Study QRC Acquisition History. Given the product and the applicable acquisition command, chances are there is a history of precedents to learn from as you attempt to craft and sell your acquisition and contracting approach. Due diligence is in order here. Cultivate Priority. Sooner rather than later, you need to engage in the customer campaign of creating recognition and definition of need and pre-selling your capability demos and existence proof for the OC. Also, use of the urgent needs process will enable development and procurement without the burden of going through the JCIDS process. Simplify. Simplify the requirement (capability) you plan to prove such that the message “going in” is you are applying existing technology. Incremental D&T. Your development and test plan must be incremental and not relegated to one ”final exam” type test. Actively Define. Be pro-active in comprehensively defining the Quick Reaction Assessment that COMOPTEVFOR will perform, which enables the decision to field. Avoid Cost of Delay. Along the way the cost of a schedule delay will emerge. Be “spring loaded” and ready to trade away some other objective. – Developing Opportunity Plans and Technology Readiness Maturation Plans. – Customized Training on Capturing Critical Enabling 6.2 and 6.3 CRAD. – Customized Opportunity Creation Training. – Enhancing Business Unit’s Opportunity Creation Efforts. August 3, 2016 by Technical Management, Inc.
TMI has contributed to numerous Opportunity Creation efforts that span the life cycle from pre-acquisition through the operations and support phase in collaboration with both system primes and technology-based product companies. The insights presented in this “Opportunity Creation” post—the first of a two-part series—highlight the experience of our principals, several of which have managed Advanced Programs Departments for A&D contractors. The definition of Opportunity Creation (OC) is self-evident. In this discussion it applies to capturing business where the customer may not have recognized and/or defined the need, solution, and means of acquiring the solution. OC’s scope of activity goes beyond just matching need with capability and involves the activities discussed in the examples presented below. This Winning Insights post discusses the importance of OC as a source of needed war fighter capability; OC as a source of revenue; and the need for speed to deploy a capability sooner. – Fewer new starts, which are often delayed. – Existing production programs that are subject to annual cutbacks. – Developments paced by fixed levels of annual funding and protracted schedules. – Fewer ‘edge out” opportunities. Thus, due to an increased competition for revenue, existing programs are being “targeted” by competitors as predatory takeaways and innovative disruptions. Whether helping to create a new start you can win, protecting and keeping a core program sold, or effecting an innovative disruption, OC is of increasing strategic importance. The Need for Speed. The 2009 Weapon System Acquisition Reform Act’s objective of reducing risk going into EMD has extended the Technology Development (TD) phase. The combination of protracted (TD and EMD) development and constrained funding delays achieving Initial Operational Capability. Meanwhile, needs continue to emerge and technology keeps advancing. And now the world market provides adversaries with access to new technology almost as soon as the U.S. Military. These adversaries are not constrained by a burdensome acquisition process. Hence, the technology gap between the U.S. and its adversaries has narrowed. Unfortunately, in many mission areas, the historical U.S. technology lead of a decade or more has shrunk to just a few years or less. While at the same time, the U.S. acquisition process time (program start to IOC) has increased in the past several decades from a few years to a decade or more (for major programs). This timeline incompatibility prompts a need for speed that can be exploited as opportunity. Contractors can and will create opportunities if they possess four key attributes: (1) an operational vision in their products’ mission areas; (2) enabling technology and technical entrepreneurs; (3) agility in an Advanced Programs culture free of the bureaucratic and process churn; and (4) a willingness to invest and the patience to risk false starts. 1. Skunk Works’ innovative application of stealth and supersonic aerodynamics conceived and won the competition for the A-12 (later named the SR-71 Blackbird). Skunk Works’ later investment in applying stealth helped to shape and win DARPA’s Have Blue Prototype competition, leading directly to the F-117 Stealth fighter. 2. Northrop’s application of curved surface stealth technology, demonstrated on DARPA’s TACIT BLUE Demonstrator aircraft built by Northrop, was a key enabler to shaping and winning the Advanced Technology Bomber that later became the B-2. 3. Science and Applied Technology, Inc. (SAT) successfully created the dual mode seeker to solve a capability gap and used the Small Business Innovative Research (SBIR) acquisition method to leverage its position as a small business. A small start-up company, SAT focused on the decades old capability gap of Anti-Radiation Homing (ARH) missiles. Enemy Integrated Air Defense Systems’ (IADS) radars would simply shut down to avoid being engaged by single mode ARH missiles (e.g., AGM-88 HARM and AGM-122 SIDEARM.). SAT started on the path to creating a dual-mode seeker to solve the capability gap with a $49,000 Small Business Innovative Research (SBIR) Phase I study. This was parlayed into a $750,000 SBIR Phase II contract focused on prototyping components for an anti-radar seeker with an active millimeter wave radar terminal seeker. The next phase (Advanced Technology Demonstration (ATD)) required customer funding. The Navy did not have funds for it. SAT subsequently coordinated multiple Congressional plus-ups of $150M over the next 5 years to fund ATD efforts and demonstrate the dual mode seeker technology to solve HARM deficiencies highlighted in Desert Storm 1 and Operation Allied Force. Using evidence from their successful ATD efforts, SAT worked with OSD’s Advanced Concept Technology Demonstration (ACTD) Office and the Navy to effect a successful 3-year ACTD program (Quick Bolt) for the AARGM dual mode seeker. Multiple successful test firings of the missile prompted the USN to cancel Raytheon’s HARM Block VI/PNU upgrade program. Also, the NAVY made AARGM an ACAT 1-C program and proceeded into EMD. In sum, technical innovation, demonstrated performance and persistence in obtaining funding paid off. SAT was acquired by ATK and AARGM today is a multi-billion-dollar program with USN, Italian Air Force, and other FMS customers. 4. An innovative disruption of the F/A-18 AAS-38 Targeting FLIR’s upgrade plan occurred with Hughes’ application of its third generation staring Focal Plan Arrays. The forthcoming fleet introduction of the Joint Stand Off Weapon (JSOW), with its greater “reach” (launch range), required the “eyes” (detection range) to target it. Thus, the need for an Advanced Technology FLIR for the F/A-18E/F was created and the resulting competition was won by Hughes. User “pull” and awareness of what newer technology could provide would not have created the opportunity on its own. An orchestrated Opportunity Creation Plan prompted and exploited user pull, in concert with technology push (validation demos), and a DTUPC (one half that of AAS-38 C) became a self-reinforcing process that created the need and won the competition. 5. Lockheed Missiles and Fire Control’s innovative lateral edge out, via DARPA, of their JASSM (Joint Air to Surface Standoff Missile APG-158) resulted in a “sole source” award of LRASM for deployment on the USAF B-1B and the Navy’s F/A-18 E/F as the solution to the anti-ship capability gap, Offensive Anti-Surface Weapon Increment 1. This a classic example of company initiative and investment to fill a mission capability gap (anti-surface warfare in denied access environments) with the enabling capability of LRASM’s standoff range and survivability. 6. Numerous foreign companies have taken advantage of the US DoD’s Foreign Comparative Test (FCT) program to field operational weapons directly with U.S. forces (in particular, with U.S. Special Forces) by demonstrating mature, off-the-shelf systems that could meet existing U.S. needs. Some examples include Saab’s shoulder-fired weapons such as the disposable AT4 tank killer and M3 Carl Gustav recoilless rifle and related family of ammunition, which met specific needs of the U.S. Special Forces (initially) and expanded into the Services (Army/Marines) to provide off-the-shelf capabilities that far exceeded what U.S. companies could provide with existing or developmental products at the time. This was possible through innovation and company investment, and a focus on the “alternative” acquisition methods within DoD, which facilitated the OC. Additional examples of foreign companies partnering successfully with U.S. companies will be discussed in Opportunity Creation Part II. Effective Opportunity Creation is an enterprise effort led by technical entrepreneurs with budget to use enterprise-wide talent in an orchestrated plan to accomplish the success. Technical entrepreneurs have challenging and exciting tasks. Historically, every company has benefitted from their efforts. Additionally, Advanced Programs have been a “well spring” for talented managers who advance to leadership positions in their Business Units. – Necessary and opportunity unique sufficient conditions for success and the associated best practices in the context of additional major Opportunity Creation examples. – Impediments to OC realization in both A&D companies and government. – OSD’s Acquisition System circumvention approaches (e.g., ATDs, ACTDs, FCTs, Rapid Development and Integration Facility, Collaboration Forum of USAF and SOCOM (RATPAC), and many others) to advance the development and accelerate fielding. July 7, 2016 by Technical Management, Inc. Whether you are a market leader or a challenger in a competition for a “franchise” program, pre-emptive pricing strategies are likely to be a factor. It can be an offensive play for the challenger—or a defensive play for an incumbent on a program being upgraded or replaced. This Winning Insights post is the second article in a two-part series on Rationalizing Pre-emptive Prices. Reflecting on TMI’s 600 engagements over the past 30 years, this article presents insights gained from three additional competitive situations where pre-emptive price was a primary Source Selection determinant (see Part 1 posted on 31 May). * Market leader (also incumbent for an airborne BMC2 program) faces the threat of a competitor offering newer technology. * Challenger beats the axiomatic winner and/or current incumbent on a competitive major upgrade by offering a credibly rationalized pre-emptive price. * Market leader protects long-term legacy, dominant market position in an open competition for mission recapitalization where the competitor offers a product with greater mission capability. * Competitor beats the customer’s defacto preferred contractor in a single-up competition between two competitors producing the same weapon in a leader/follower development and production. * Incumbent, threatened by strong competitor in an OSD initiated competition, defends its position and beats the competitor who offers a rationalized pre-emptive low EMD price. Market leader protects long-term dominant market position (based on research from open source articles). KC-135 Replacement. The initial competition was won by the Northrop Grumman and Airbus (NG&A) team with an A-330-based offering having greater capability than the Boeing 767-based offering. NG&A was evaluated to have the lowest Total Evaluated Price (TEP). Boeing protested the award and the protest was sustained. OSD then weighed in and SECDEF cancelled the competition to preclude a reinstitution of the current competition. This decision to start over with a new competition later led to an OSD-approved acquisition plan with modified evaluation factors and a change to fixed price contracting. Upon seeing the new final RFP, Northrop Grumman elected not to bid. This left USAF with a no competition dilemma. After OSD and USAF encouraged EADS-North America (Airbus USA) to bid, the competition was held. Not winning in the initial competition had shocked Boeing. They realized that if Airbus won, and assembled A-330-based tankers in Alabama, it would not only end Boeing’s 60+ year USAF tanker franchise but would enable Airbus to further dilute Boeing’s share of the U.S. domestic airline market. Thus, there was a Boeing top down imperative to win. In the new competition, if competitors’ offers met over 200 mandatory requirements, government evaluated TEP would become decisive in the source decision. From the USAF debriefing on the initial competition evaluation and other discovery, Boeing was aware of NG&A’s price in its initial offer and thus could analyze and “target” Airbus’s likely price in the new competition and arrive at a price to win. In a comparison of total program prices of initial offer versus new offer, adjusted for schedule differences and inflation, Boeing’s new offer price on the total package (FPIF RDT&E and the FFP Production) was significantly less than its initial offer price adjusted for the new offer contract terms. For the total package offer, Boeing’s price was approximately 5-6% (net present value) less than EADS’ (Airbus) price on a total program valued at approximately $35 billion. Boeing must have concluded that the strategic gain was worth the price risk. Also, unlike in the initial competition, Boeing’s top leadership “forged” better cooperation for cost determination and reduction between its Military Aircraft Unit (which bids and delivers the tanker) and its Commercial Aircraft Unit (which provides the 767 platforms for modification to the tanker configuration). Price risk could be mitigated if the USAF, OSD, and Congress do not deliver, exactly as planned, on their side of the deal for 179 units across the 17-year contract. Constructive and/or programmatic changes could occur. Boeing won and perpetuates its tanker dominance. Competitor beats the likely preferred contractor in a production single-up competition between two contractors producing the same weapon. As the protracted countdown for release of a production single up slipped to the right, Contractor B, the customer’s likely preferred contractor, was pushing for an early single up. More than 10 years earlier, Contractor A won the original RDT&E and the lead producer role in the subsequent leader/follower production program (competed annual split buys). Subsequent to winning the RDT&E, Contractor A had competed against B (production follower) and had lost two important engineering support programs for the acquisition customer. One contract was critical for the weapon’s Mission Planning. The other was a Weapon System Engineering contract to help the acquisition customer in its role of integration across the broad set of contractors and government labs involved in the program. Thus, Contractor B became the likely preferred contractor for the single up. This preferred posture was enabled by the continuing daily interactions of Acquisition Program Office personnel with Contractor B’s system engineering personnel, who were co-located with the Acquisition Program Office. Even though the single up source selection would be stated as best value award, both contractors knew that all up round average unit production price would be decisive in winning. Contractor A projected that the customer would also buy several thousand more units after the single up production run was completed. In effect, at stake was a franchise program for the next 30 years. Contractor A’s consulting firm estimated Contractor B’s average unit cost advantage to be 10-12% based on bill of material (BOM) cost differences, manufacturing cost differences, and rate differences. Also, if the customer needed to use a best value premium to “reach” for Contractor B that premium would not exceed more than 4-5% since both contractors had been producing the same weapon for years. Thus, Contractor A had a cost/price problem of 14-17 %. This set the stage for Contractor A to rationalize a pre-emptive price by engineering cost out of its in-house tasks and out of the BOM, which represented 80% of all up round unit cost. Focusing on the cost leverage in the BOM and benefitting from the added time due to the customer announcing a one year delay, Contractor A set ‘gamey” buy to goals for the major cost items in the BOM. Setting the goals was the easy part. The hard part entailed implementing, for each of the largest cost items comprising 85% of the BOM, a team consisting of an engineer with functional responsibility for the subsystem being procured, a senior buyer with negotiation experience, and a cost analyst to work with each supplier. In each team’s collaboration with suppliers, costly but non critical specs, invented by Contractor A in the initial proposal, were scrubbed and unnecessary, but costly below the line data, etc., was eliminated to significantly reduce supplier prices in the “all (winning) or nothing (losing)” scenario. Further, a recently retired Contractor A Vice President of Procurement, who earlier worked as an engineering manager, was called back to active duty for a year to manage the BOM cost reduction efforts. Contractor A won with a pre-emptive price they rationalized and worked exhaustively to implement. Contractor A’s all up round price was less than the Contractor B’s BOM. This became the basis for Contractor B’s protest, which was not sustained. Contractor A continues to enjoy its franchise program. Incumbent, threatened by strong competitor in an OSD initiated competition, defends its position and beats competitor who offers a rationalized pre-emptive low EMD price. The incumbent knew it could match or better the technical capability the challenger recently developed for two fighter sensor programs for other customers. But the incumbent did not have the rich menu of NDI and qualified components the challenger enjoyed. This prompted an effort to re-engineer how the incumbent designed, procured its subsystems, and manufactured its sensors. Further, the incumbent’s Business Unit General Manager decided to forge commonality into it three new sensors (TSUP and two others being developed for other platforms) to reduce the TSUP’s NRE cost and get cost saving from common IRAD investments, etc. In spite of commonality savings and capital investment for Engineering Development Models and other clever EMD cost saving initiatives, the incumbent’s EMD cost would exceed the challenger’s by tens of millions. Thus, the incumbent concluded that it could not win a head-to-head EMD competition given the cost lift enjoyed by the challenger. The incumbent then decided to change the game by pushing to expand the scope of the offer to include an NTE unit cost for LRIP and an average unit cost estimate for Full Rate Production (FRP) units. This would broaden the scope of the offer, extend the contract horizon, and raise the cost base (EMD plus LRIP plus FRP) to be evaluated. Further, the challenger would be burdened with actuals from its recent LRIP deliveries wherein unit cost significantly exceeded original estimates. This prompted the incumbent to initiate a comprehensive Design To Unit Production Cost (DTUPC) effort driven by a “gamey” top-down goal that would be out of reach for the challenger. The Program Technical Director was charged with managing and realizing the DTUPC goal. Additionally, the incumbent knew USAF would ultimately task the platform prime to host the competition and make the source selection. Thus, the incumbent decided to monetize the integration risk that it and the platform prime had already mitigated in three earlier integrations of TSUP-A, B, and C on the platform. This monetized risk of $90 million actual cost gave meaning to a theme: “incumbent’s fourth time integration versus challenger’s first time integration.” Then later in source selection, the prime used the monetized risk in arriving at the challenger’s most probable cost. Also, fortune smiled on the incumbent when USAF and the platform prime delayed the competition for a year. This helped fix the incumbent’s schedule problem. Thus, the incumbent “checkmated” the challenger’s pre-emptive EMD price and retains its major program. Our Winning Insights series will continue with next month’s article: Opportunity Creation in the 2016-2020 Competitive Environment. May 31, 2016 by Technical Management, Inc. Whether you are a market leader or a challenger in a competition for a “franchise” program, pre-emptive pricing strategies are likely to be a factor. It can be an offensive play for the challenger—or a defensive play for an incumbent on a program being upgraded or replaced. Reflecting on TMI’s 600 engagements over the past 30 years, this article—the first in a monthly series of Winning Insights—presents insights gained from classic competitive situations where pre-emptive price was a primary Source Selection determinant. What Is a Pre-emptive Price? Given an acceptable technical offer, it is the “Godfather” offer price—the offer the customer cannot refuse. It cannot be denied, in spite of cost realism and risk based adjustments for Most Probable Cost (MPC), best value trade-off analysis in assessing Total Evaluated Price (TEP), or Value Adjusted Total Evaluated Price (VATEP). * Market leader (also incumbent for an airborne BMC2 program) faces the threat of later technology and greater mission capability in a competitor offer. * First-to-market “strategic win” of a later generation technology product against a competitor (who earlier pioneered the first generation development). * Competitor beats the customer’s defacto preferred contractor in a single-up to one contractor in a competition between two companies producing the exact same weapon. * Challenger beats the multi-decade incumbent in a competition for the next generation space system for a critical mission. * Incumbent, threatened by strong competitor in OSD initiated competition, defends its position and beats the competitor who offers what could have been a pre-emptive price. Relevant Experience. In TMI’s 30 years and 600 consulting engagements, we have contributed to both winning with a pre-emptive price and defending against pre-emptive pricing by competitors. * Winning. TMI helps clients build their business case to justify the pricing risk needed to win “franchise making” opportunities. Further, we help develop and pre-sell the technical and programmatic evidence to convince the acquisition customer that the integrated product offering (technical, schedule, and price) is executable. * Defending Against. Pre-emptive pricing is likely in cases where the assessment of “What Winning Means for the Competitor” is huge and/or where winning is the competitor’s entry path into a strategic market. In the pre-RFP phase, we help develop and pre-sell the offer to counter the competitor’s likely combination of technical capability and price (low or pre-emptively low). Winning insights are presented below for three of the competitive situations described earlier. * Defining, through mission analysis, threshold capability required. * Deriving and pre-selling the acquisition customer an affordable unit cost goal, based on actuals and company investments in continuous cost reduction. And thus, informing the customer on needed contractor funding. * Offering a robust lifecycle technology insertion program. * And, finally bidding a unit price at least 10% less than the affordability goal. Meanwhile, the competitor attempted to rationalize a best-value offer based on greater than threshold capability. The competitor’s price—with company investment—was within the available budgeted funds. The Source Selection cost evaluation “risked up” the competitor’s Total Evaluated Price (TEP) to a value exceeding the budget. The market leader’s TEP was 20% less than that of the competitor. Beating the Axiomatic Winner With a Rationalized Pre-Emptive Price. In a competition to develop a new capability upgrade for a surface-launched interceptor missile, the axiomatic winner (incumbent) submitted a “business as usual” credible proposal that received a higher technical evaluation rating. Meanwhile, the challenger, being in the interceptor missile business for a different U.S. military customer, had a strategic objective of breaking into the incumbent’s market. The EMD consisted of developing and integrating the seeker upgrade and building several hundred LRIP units for testing and live test firing evaluation. The development involved technical advances in response to a dynamic definition of the threat. Additionally, LRIP was the major share of evaluated EMD cost. Because funds were limited, the challenger bet it would not be productizing and producing the technical baseline exactly as proposed. Further, it would not likely have to deliver the number of LRIP units per the planned annual buys in the RFP. Therefore, the strategy to win a new customer—was a pre-emptive price. Also, the challenger reasoned that, in reality, the contract had “get well” potential, which reduced the pricing risk. Thus, the challenger priced the CPIF NRE tasks aggressively, supported with a solid cost credibility and completeness story. The challenger also used a “gamey” progress learning curve to lower the average unit price of the LRIP units. This pricing strategy resulted in a significantly overall lower price. The customer’s MPC adjustments could not offset the winner’s pre-emptive price without prompting a solid basis for a sustainable protest. First to Market Win to Develop a Next Generation Weapon. The winner knew going in that the competitor to beat had helped shape the requirements and the acquisition plan. And, this competitor was likely to be evaluated as having best technical offer. Thus, the winner worked to have a technically acceptable proposal with a credible cost. Moreover, a comprehensive risk mitigation plan supported their claim of an executable program. Further, the winner’s leadership saw winning as the strategic first entry into a much bigger and broader market (additional customers), making the win a “franchise maker.” The pre-emptive price was rationalized as a warranted (by CLIN) company investment of 40% of the total bid price for the EMD (NRE and LRIP). The Source Selection Authority (PEO for several similar program), concerned about available funds for existing EMD efforts in his program area, asked the evaluation team leader how the competitors ranked. When told the rankings, he asked if they were all technically acceptable. He got a “yes, however…” response. He then asked the PCO and the legal counsel if the warranted investment terms were legal and enforceable. With their “yes” answer, he had an offer he could not refuse. Our Winning Insights series will continue with next month’s article: Preemptive Pricing Part 2 – Insights from Additional Competitive Situations.